This is “Central Asia and Afghanistan”, section 8.7 from the book Regional Geography of the World: Globalization, People, and Places (v. 1.0). For details on it (including licensing), click here. Understand that Central Asia is a landlocked region that receives little rainfall and has to rely on water from major rivers flowing from the mountains in the east. Summarize how Central Asia has been transitioning from a Soviet-dominated region to independent states and what has been occurring in the various states to adapt to the new economic environment. Describe how the Aral Sea has been affected by the practices of water use in the region and the environmental consequences that have resulted from water use policies. Explain the geopolitical history of Afghanistan and why this area has been so difficult to govern under a central government. Learn why there is continual conflict in Afghanistan between Western military forces and local Taliban insurgents. Understand the principle that globalization of the economy forces political units to compete over natural resources. Central Asia is a region in the Asian continent that extends from the mountains of western China to the shores of the Caspian Sea. Pakistan and Iran create the southern border of the region, and the vast expanse of Russia is to the north. Afghanistan is considered a part of the region even though it was never a formal part of the Soviet Union. Central Asia was located on what was known as the Silk Road between Europe and the Far East and has long been a crossroads for people, ideas, and trade. Central Asia has an extremely varied geography, including high mountain passes through vast mountain ranges, such as the Tian Shan, Hindu Kush, and the Pamirs. The region is also home to the vast Kara Kum and Kyzyl Kum Deserts, which dominate the interior with extensive spans of sand and desolation. The expansive treeless, grassy steppes that surround the desert regions are considered an extension of the steppes of Eastern Europe. Some geographers think of the Eurasian Steppes as one single, homogenous geographical zone. Under the sand and prairie grasses lay the some of the most extensive untapped reserves of gas and oil on the planet. Natural resources are the main attraction of the region driving the economic forces that determine the development patterns of individual countries. Multinational corporations have vigorously stepped up their activity in the region. The political systems are adjusting from the old Soviet Union’s socialist policies to new democratic systems that are subject to high levels of authoritarian rule and corruption in business and politics. Most of the groups of Central Asia were nomadic peoples who rode horses and herded livestock on the region’s vast steppes. This way of life continued until the 1920s, when the Soviet Union forced many of the groups to abandon their lifestyle and settle on collective farms and in cities. Most of the people of Central Asia continue to identify culturally with their nomadic past. Central Asians who live in cities often demonstrate a mix of local and Russian culture in terms of dress and food because of the large influx of Russian populations in the region. More than six million Russians and Ukrainians were resettled into Central Asia during Soviet rule. Russian is often used as a lingua franca. One of the primary ways in which people distinguish themselves culturally is through religious practices. Despite the area being part of the Soviet Union, where religious activities were discouraged, Islam was and still is the dominant religion. Most Central Asian Muslims are Sunnis. Afghanistan is also usually included as part of Central Asia, though it was never officially part of the Soviet Union. Source: Updated from map courtesy of University of Texas Libraries, http://www.lib.utexas.edu/maps/commonwealth/central_asian_common_2002.jpg. The traditional people of Kazakhstan, who share a Mongol and Turkic heritage, moved into the Central Asia region sometime after 1200 CE. The expansion of the Russian Empire under the tsars integrated Kazakhstan and its neighbors, which eased their transition when the tsarist system of Russian government gave way to the Soviet Union. The influx of Russian people and culture had a major influence on Kazakhstan. The Aral Sea is decreasing in volume because of water being diverted from the two rivers to be used for irrigation of desert lands to grow enormous crops of grains and cotton. Source: Updated from map courtesy of NASA, http://visibleearth.nasa.gov/view_rec.php?id=5227. 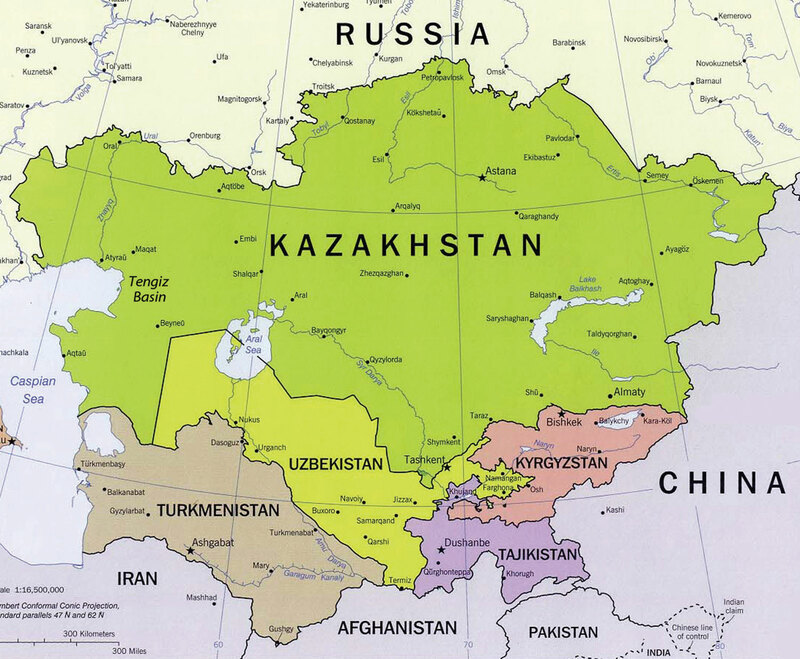 Kazakhstan gained independence from the Soviet Union in 1991, thereby creating the world’s largest landlocked nation. It is the ninth-largest state on the planet in terms of square miles and is larger in physical area than of all of Western Europe. This vast land is host to a wide variety of physical landscapes, including the high, snow-capped peaks of the ranges on the Chinese border. The western portions are lowlands bordering the Caspian Sea. The seemingly endless grasslands of the interior are one of the largest steppe regions in the world. The steppe region has a semiarid type B climate. A large portion of southern Kazakhstan is desert, including the northern regions of the Kyzyl Kum Desert. Colder type D climates are found in the northern regions of the country. The steppe produces grain in large quantities and other agricultural products, while the productive mining of minerals adds to the national wealth. Kazakhstan ranks high in the mining of many metals and uranium. Even diamonds are found here. Oil and natural gas extraction accounts for the largest sector of the country’s economy and generates the largest export income. The Tengiz basin around the northeast shores of the Caspian Sea is home to extensive petroleum reserves. Oil pipelines are expanding to transport the oil to port locations and other countries, including China. The economy of Kazakhstan has been larger than the economies of all the other Central Asian states combined. 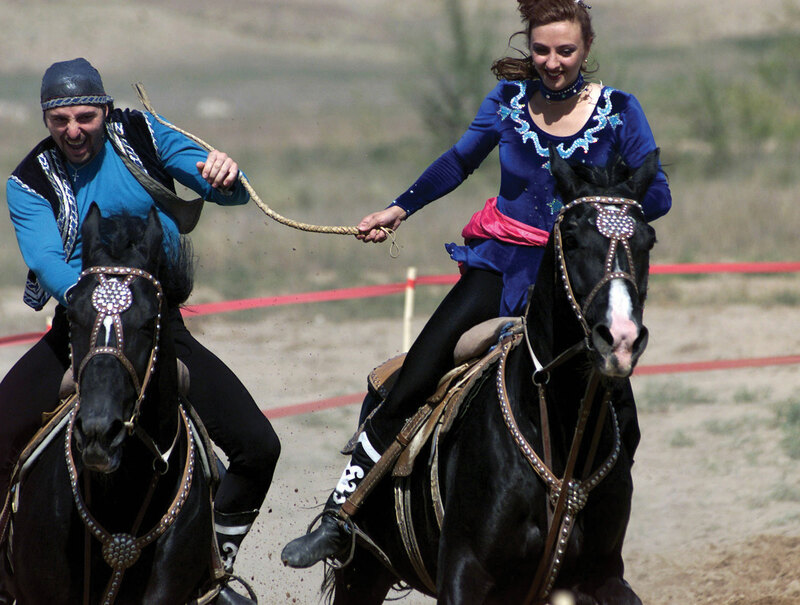 Kazakh performers demonstrate a cultural tradition of a game called “Catch a Girl,” in which the two riders (male and female) take off on horseback and try to catch each other. The female rider whips the male until she is caught. If the male catches the female, he is rewarded with a kiss. Source: Photo courtesy of the US Air Force, http://commons.wikimedia.org/wiki/File:Catchthegirl.JPG. Kazakhstan also has a forward capital. During the Soviet era, the capital was located in the southeast at Almaty, but after gaining independence in 1991, the capital was moved north to Astana to ensure that the Russian-dominated northeast would be monitored against devolutionary forces that desiring to secede and become part of the Russian Republic. 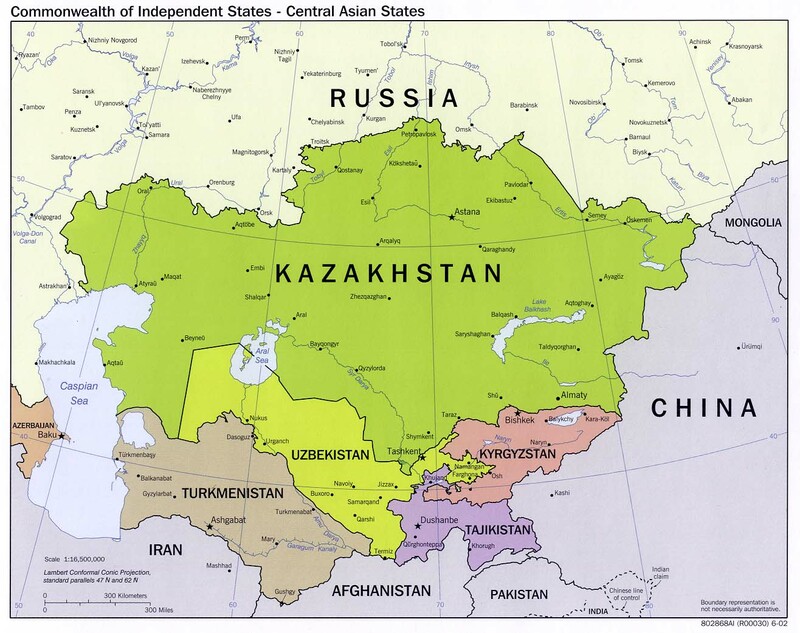 Uzbekistan physically borders all the Central Asian countries. It is the most populous Central Asian country, with a population that exceeds twenty-seven million. Uzbekistan’s eastern boundary extends deep into Kyrgyzstan territory. The boundary lines were created during the Soviet era to provide the central government with more control over its republics by politicizing enclaves to their benefit. Geographers call Uzbekistan a doubly landlocked nation because all the countries that surround it are also landlocked. The main source of fresh water comes from the Eastern Highland regions. The main rivers have been heavily diverted for irrigation and are often depleted before reaching their destination at the Aral Sea. Cotton is the main agricultural crop. Uzbekistan is one of the top producers of cotton in the world and is a major exporter to world markets. The central and western regions have mainly arid desert climates and rely heavily on the fresh water flowing in from the mountains. Agriculture employs a full one-fourth of the population and accounts for one-fourth of the gross domestic product (GDP). The extraction of gold, minerals, and fossil fuels are also prime economic activities. The country has been transitioning from the old Soviet Union’s command economy, which was controlled by the central government, to a market economy competing in a global marketplace. Uzbekistan is a country of young people: about one-third of the population is under the age of fifteen. Education was heavily emphasized during the Soviet era; as a result, about 99 percent of the population is literate—though about one-third of the people still live in poverty. Islam emerged in this country after Uzbekistan won its independence in 1991 after the fall of the Soviet Union. In a culture of openness, Islam has risen in prominence to the point that approximately 88 percent of Uzbeks profess Islamic beliefs. The most commonly spoken language is Persian/Farsi. Samarkand and the country’s capital city, Tashkent, are located in the eastern core region, which is home to most of the population. Tashkent has an unofficial population of more than three million people. The city, which sits on the confluence of a local river and its tributaries, started as a caravanserai, or oasis for trade, along the Silk Road. Samarkand is Uzbekistan’s second-largest city and is most noted as the central city of the Silk Road as well as an important historical city for Islamic scholars. In 2001, UNESCO declared this 2,750-year-old city a World Heritage Site. It is one of the oldest continually inhabited cities in the world and has been one of the more important cities in Central Asia. The historical architecture is heavily influence by Islamic styles from Iran. The region around Bukhara, Uzbekistan’s fifth-largest city, has been occupied for at least the last five thousand years. Bukhara was another important city on the Silk Road and is known for its Asian carpet and textile industry. This region has been an important cultural, economic, and scholarly center for most of its known existence. 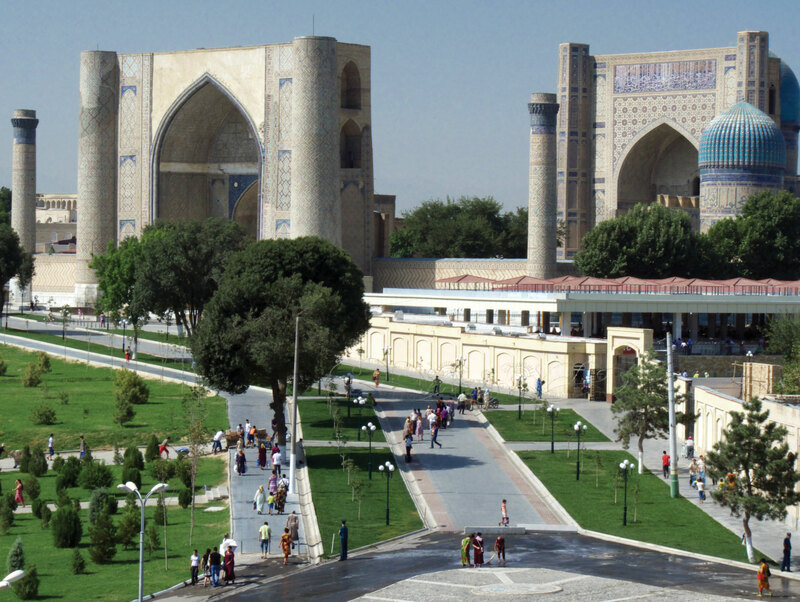 Samarkand, called the crossroads of culture, is located on the ancient Silk Road to China. The city is a UNESCO World Heritage Site. Source: Photo courtesy of Laura and Fulvio, http://www.flickr.com/photos/lfphotos/4934027017. 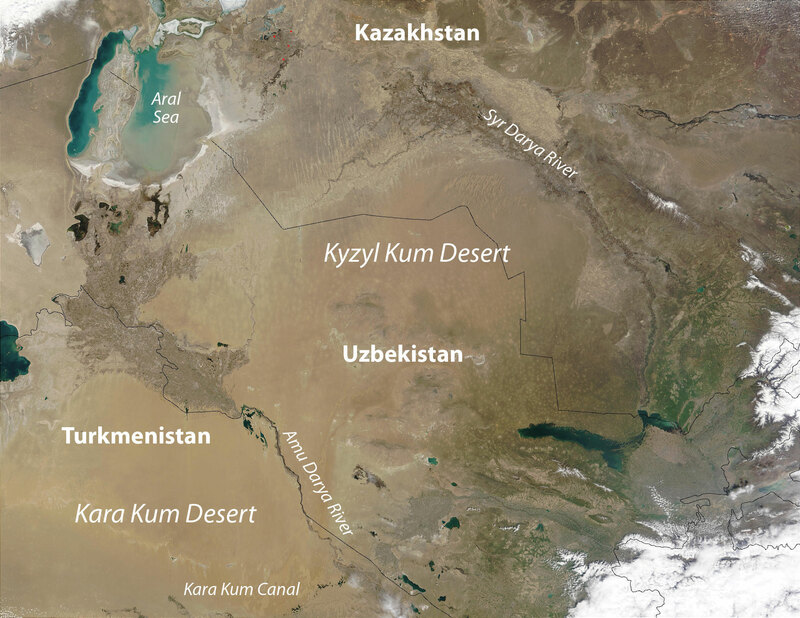 Central Asia’s shrinking Aral Sea is shared by Uzbekistan and Kazakhstan. The sea was once the fourth-largest body of water in the world, but it has been reduced to a fraction of its original area. In 1960, the Aral Sea covered about 26,254 square miles, an area larger than the size of the US state of West Virginia. By 2009, the sea covered less than 10 percent of the same area. The entire eastern portion of the sea has become a sand desert, complete with the deteriorating hulls of abandoned fishing vessels. The loss of water is approximately equivalent to the complete draining of both Lake Erie and Lake Ontario in North America. The water loss escalated when the Syr Darya River, which flowed into the northern part of the sea, and the Amu Darya River, which flowed into the southern side of the sea, were diverted for the irrigation of cotton and other crops. At about 1,500 miles long, the Amu Darya is the region’s longest river. Its source is the high mountain streams and lakes of the Pamir Mountains. Environmental problems were further exacerbated by the extensive use of pesticides and fertilizers in agricultural processes. The chemicals contaminated the water flowing into the Aral Sea. Once the water dried up in the sea, the winds carried the buildup of chemicals and salt from the dry seabed over the land, causing serious health-related problems in the nearby human population. Cancer and respiratory illness rates continue to be higher than normal. Water and land pollution is a serious problem. Even the climate around the Aral Sea has changed gradually because of the loss of water from evaporation for precipitation. The climate is getting warmer in the summer and colder in the winter. The moderating affect that this large body of water had on its surrounding area is no longer as prominent as it once was. 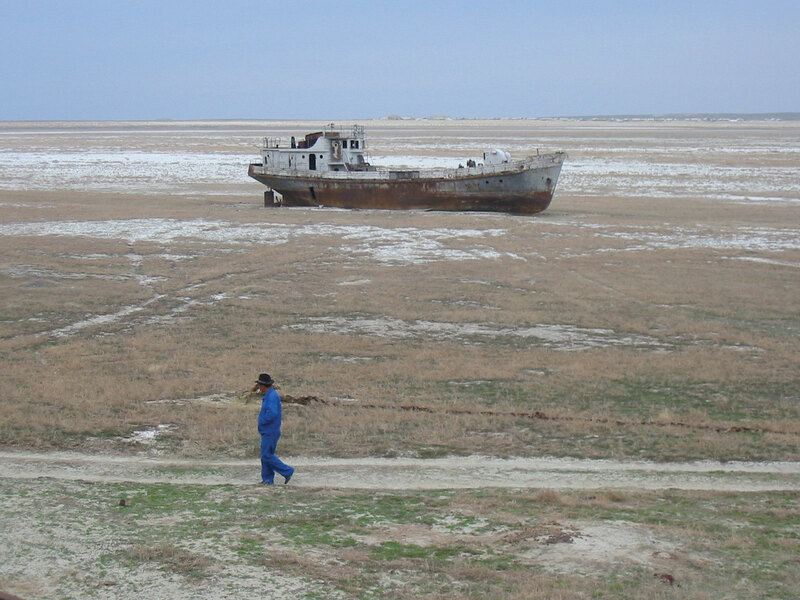 The decline of the Aral Sea has destroyed habitats and the local economy. The fishing industry, which employed more than sixty thousand people, has been devastated. The remaining western portion of the sea has a rising salt content that is contributing to the decline of the fish population. Adding to the environmental devastation, the Soviets conducted biological weapons experiments on an island that was once in the middle of the Aral Sea. Hazardous wastes such as anthrax and toxic chemicals contaminated the land and found their way into the sea. Efforts have been made to marginalize the environmental damage of the contamination, but the damage has not been completely ameliorated. The sea has historically been an important environmental location for wildlife. It is located in a major flyway for migratory waterfowl in Central Asia and served as an important habitat. The deterioration of the Aral Sea and the destruction of habitat for waterfowl and other organisms is one of the world’s worst environmental catastrophes. The fact that the Aral Sea is located in a region that is not part of the core economic area of the global community has rendered it “out of sight and out of mind” by entities that could potentially provide economic support. In the northern portion of the Aral Sea, called the Little Aral Sea, there has been some success in abating the deterioration of this once-thriving environmental habitat. A major dam has been constructed that partitions off the Little Aral Sea, causing water from the Syr Darya River to increase the water level of the Little Aral Sea and reduce the salt content. Canals, dikes, and irrigation processes have been updated to reduce the loss of water and increase the amount that flows into the northern section. The development efforts have caused the water level to rise and therefore have reinvigorated the once-struggling fishing industry. The efforts have been undertaken by Kazakhstan’s government, which controls the Little Aral Sea. The eastern half of the sea is completely dry. Source: Photo courtesy of Staecker, http://commons.wikimedia.org/wiki/File:Aralship2.jpg. A major part of the southern portion of the once thriving sea is located in Uzbekistan, which has not contributed the economic attention necessary to halt the sea’s continued deterioration. The remaining western portion of the Uzbekistan side of the Aral Sea will continue to shrink if measures are not taken to address the loss of water from the Amu Darya River. The eastern side was completely dry by 2009. Uzbekistan has responded to the situation by contracting out to various multinational oil companies from Korea, China, and Russia to explore for oil beneath the dry seabed. The demise of the Aral Sea was caused in part by the diversion of water from its northern inlet, the Syr Darya River. At the other end of the Syr Darya River an additional factor augmented the lack of water flow: the Soviet Union placed a dam on the river and allowed the overflow from the dam to flow into low-lying dry pans, creating artificial lakes. As a result, Aydar Lake was created and became the second-largest lake in Uzbekistan. Various species of fish were introduced and the lake became a major source for commercial fishing. Hundreds of tons of fish are harvested annually. Just as fishing was declining in the Aral Sea, the fishing industry was growing at Aydar Lake. 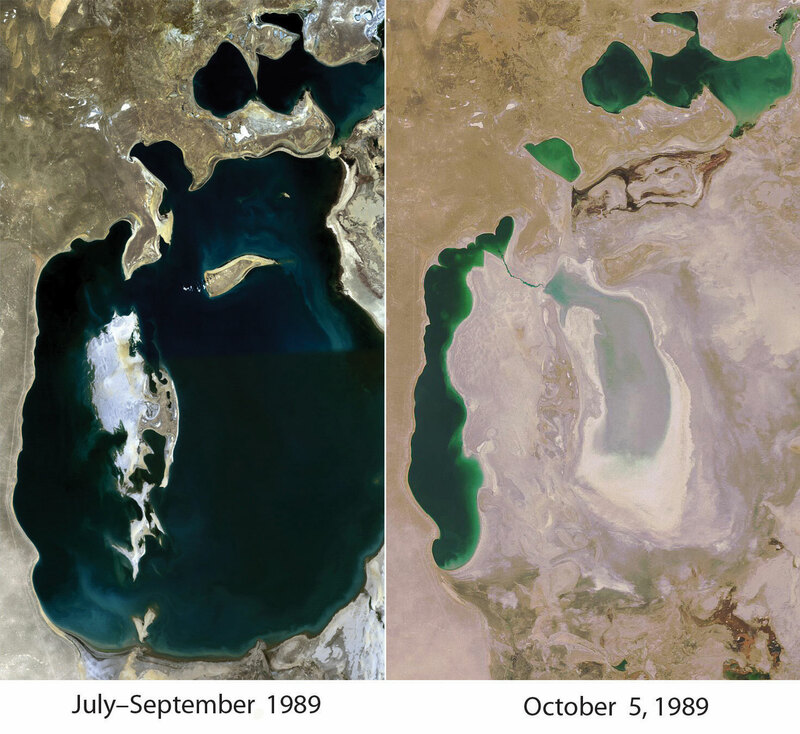 These satellite images compare the Aral Sea between 1989 and 2008. The eastern region was completely dry by 2009, whereas the northern portion was responding favorably to Kazakhstan’s conservation efforts. Source: Images courtesy of NASA and Zafiroblue05, http://commons.wikimedia.org/wiki/File:Aral_Sea_1989-2008.jpg. To the south of the Amu Darya River is the desert country of Turkmenistan, which extends from the Caspian Sea to Afghanistan in the east. Turkmenistan is slightly larger in physical area than the US state of California. Roughly 80 percent of the country is covered by the Kara Kum Desert, which is among the driest in the world. The southern mountains along the Iranian and Afghan border reach as high as 10,290 feet in elevation. Water from the Amu Darya River has been diverted by the seven-hundred-mile-long Kara Kum Canal through Turkmenistan to help grow cotton and other agricultural products. The transition from a Soviet republic to an independent state in 1991 brought many changes. The former leader of the Turkmen Soviet Socialist Republic, Saparmurat Niyazov, who went by the name Turkmenbashi (leader of the Turkmen people), dominated the presidency for fifteen years. Through his authoritarian rule, he promoted a traditional culture—with Islam as the predominant religion—and was notorious for developing a cult of personality. For example, he changed all the names of the days of the week and the months of the year to his name, the names of his family members, and the names of Turkmen heroes or famous people. Turkmenbashi’s image was printed on the currency, and large posters of him could be seen throughout the country. His book on important concepts, the Ruhnama (The Book of the Soul), was to be read by all schoolchildren and the public. After his death in 2006, many of his actions were reversed. The country continues to transition to a stable democratic state, though many of the same dynamics of corruption and authoritarian rule remain. Turkmenistan is blessed with the fourth-largest natural gas reserves in the world; the top three are Russia, Iran, and the United States. The income from natural gas exports has become the country’s greatest means of gaining wealth. Because Turkmenistan is landlocked, its government has been forced to partner with Russia to use of Russia’s pipelines to export the natural gas. Not wishing to rely on Russia’s monopoly on the pipelines, Turkmenistan developed an additional pipeline to China to help boost income and profits. Many international corporations are seeking to do business in Turkmenistan and Central Asia to corner a piece of the vast natural resources. Corporate colonialism is extremely active and has contributed to a high level of corruption in the government and the business sector. It is unclear how much of the country’s wealth filters down to most of the population. Over the past decade, unemployment rates have exceeded 50 percent, and more than half the population lives below the poverty line. The administrative center and largest city of Turkmenistan is its capital, Ashgabat, which has a population of about one million. Ashgabat lies between the Kara Kum Desert and the mountains near the former Silk Road. In the historic region of Central Asia, it is comparatively a very young town, having grown out of a small village founded in 1818. Ashgabat is primarily a government and administrative center, although it has thriving cotton, textile, and metalworking industries. Ashgabat is also a popular stop along the Trans-Caspian Railway. Local groups in the mountains of Central Asia make up the population of Kyrgyzstan. The forty rays of sun on the country’s flag symbolize of the legendary forty tribes of Manas that represent the nation. The rugged landscape of this mountainous land includes the high ranges of the Tian Shan Mountains, which can reach elevations as high as 24,400 feet and cover about 80 percent of the country. Snowfall from the mountains provides fresh water for agriculture as well as hydroelectric energy. Food crops can be grown in the valleys and the few lowland areas. Half the population works in agriculture, and self-sufficiency in food production is a major objective for survival. The mountains hold deposits of metals and minerals that have a strong potential for adding to the national wealth. Oil and natural gas reserves are also available for exploitation. The government is seeking foreign aid and investments to help develop these resources. In 2009, Kyrgyzstan had a population of about 5.4 million in a land area about the size of the US state of South Dakota. About 30 percent of the population is under the age of fifteen, and about 36 percent of the population is urban. The western boundary with Uzbekistan and Tajikistan is winding and creates various small enclavesTerritory of one country that is entirely surrounded by another country. and exclavesTerritory of one country that is physically separated from that country. of people from one country surrounded by people of another country and separated from their home nations. 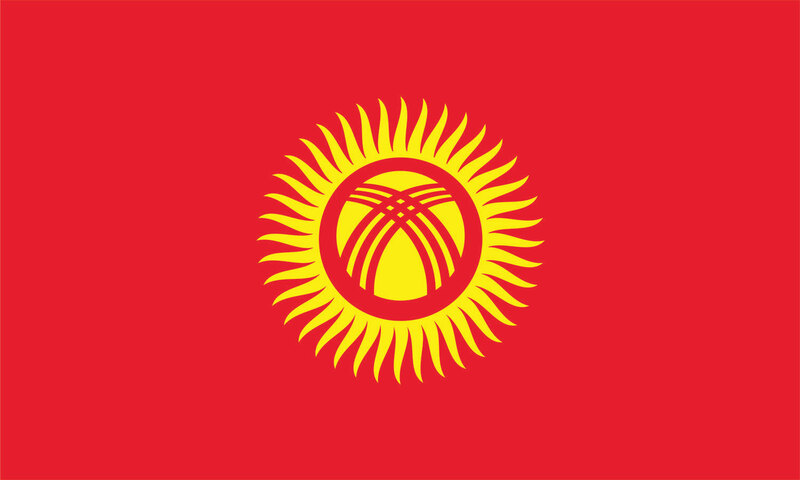 The flag of Kyrgyzstan has a symbol of the sun and forty rays of light indicating the legendary forty tribes of Manas that represent the nation. Source: Drawing by Andrew Duhan, http://commons.wikimedia.org/wiki/File:Flag_of_Kyrgyzstan.svg. Kyrgyzstan’s transition from a Soviet republic to independence was not smooth. The loss of the state social safety net pushed the economy further to the informal sector, where trading and small transactions for personal survival are common. Shortages of consumer goods occur in rural areas and small towns. Kyrgyzstan is an isolated country that has been working to integrate itself into the global economy through technology and modernization. In 2010, clashes between Uzbeks and Kyrgyz brought about riots in the streets of major cities, resulting in more than two hundred casualties and three hundred thousand displaced citizens. After the situation cooled down, the government worked to stabilize itself with new leadership. The mountain in background is Khan Tengri (22,949 feet). 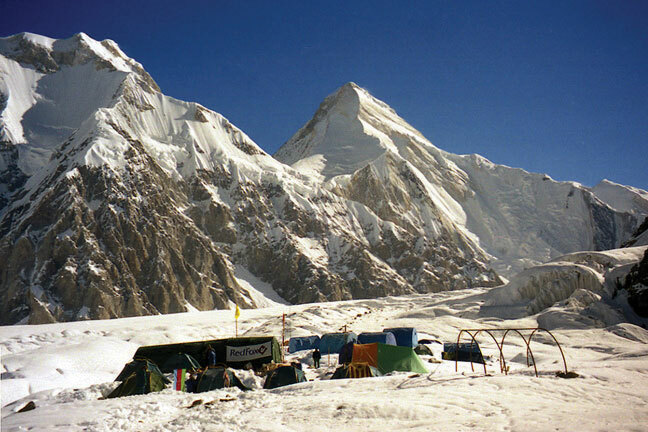 Source: Photo courtesy of Simon Garbutt, http://commons.wikimedia.org/wiki/File:South_Inylchek_Base_Camp.jpg. A form of improvisational oral poetry, which allegedly dates back to more than one thousand years ago, is an aspect of traditional culture that has been preserved. While common throughout the region, it is mainly found in Kyrgyzstan and Kazakhstan. Practitioners will often engage in “lyrical battles” of folklore. These poets, often accompanied by two- or three-stringed instruments, will recite the Manas, an epic poem of Kyrgyzstan that details the life of the Kyrgyzstan hero Manas. This epic tale is a renowned part of the culture and festivals of Kyrgyzstan. 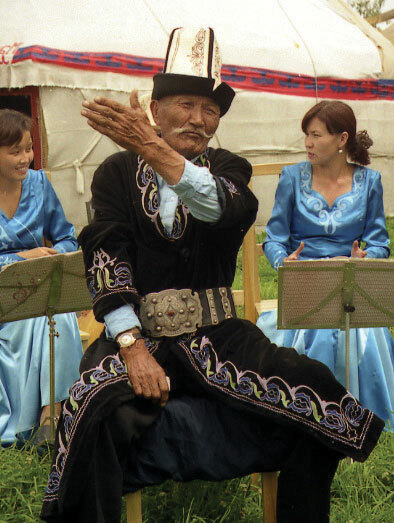 A manaschi—a traditional storyteller—in Karakol, Kyrgyzstan, who has memorized entire epic legends of his history, recites the stories to others at a local festival. Source: Photo courtesy of Simon Garbutt, http://commons.wikimedia.org/wiki/File:Kyrgyz_Manaschi,_Karakol.jpg. The eastern region of Central Asia has some of the highest mountain ranges in the world; about 90 percent of Tajikistan is mountainous, and more than half the country is 10,000 feet in elevation or higher. Ranges of the Himalayas extend from the south all the way to the western border with China. The Pamirs is a mountain range located where the Tian Shan, Karakorum, and Hindu Kush mountain ranges meet in Tajikistan, an area referred to as the Pamir Knot, or the roof of the world. Elevations in the Pamirs often exceed 24,500 feet. The Pamirs is the source of the Amu Darya River and is home to the longest glacier outside the polar regions (forty-eight miles long in 2009). There is great potential for hydroelectric power generation, and Tajikistan is developing the world’s highest dam. 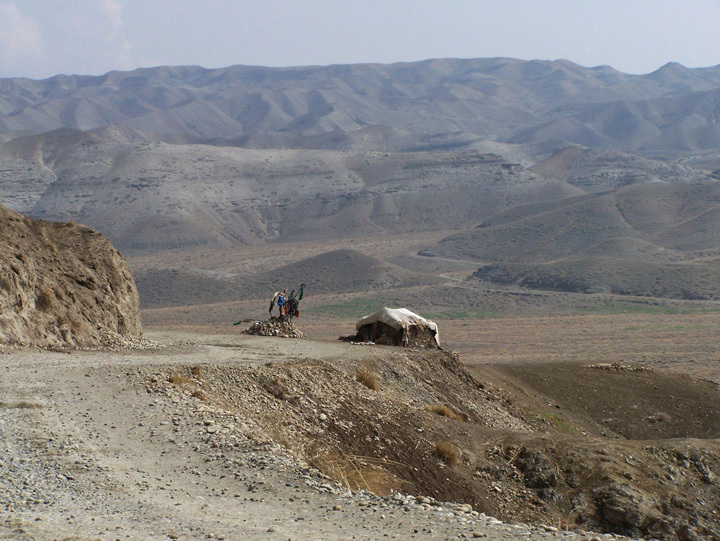 Tajikistan has the smallest physical area of any country in Central Asia but has a population of about 7.3 million. Only about one-fourth of the population is urban, and one-third of the population is younger than fifteen years of age. There is less ethnic or religious diversity; 80 percent of the people are ethnically Tajik and are Sunni Muslims. Though it has natural resources similar in quantity to those in Kyrgyzstan, Tajikistan’s economy is not advanced enough to fully take advantage of its economic potential. Half the labor base works abroad and sends remittances back to their families for economic support. Unemployment is high, and job opportunities have not been able to keep up with demand. Dushanbe, the capital and largest city of Tajikistan, is situated on the confluence of two local rivers and is famous for its Monday markets (Dushanbe means “Monday” in Tajik). Dushanbe, like Ashgabat in Turkmenistan, was originally a small village; it became an administrative center for the region when the Soviet army conquered the area in 1929. Similar to many of the other cities and regions in Central Asia, the Soviets transformed the political and economic landscape and made Dushanbe a center for cotton and silk production. The Soviets also transformed the cultural and ethnic makeup of the city by relocating tens of thousands of people from Russia and other regions of Central Asia to Dushanbe. The transition from a Soviet Republic to an independent country in 1991 was difficult for Tajikistan. From 1992 to 1997, a bitter civil war between regional factions killed more than fifty thousand people. Political instability and corruption has hampered the growth of a market economy, and political power remains in the hands of the economic elite. Debt restructuring with Russia and an infusion of development loans from China have aided the ailing economy. Aid from the US helped fund a thirty-six-million-dollar bridge linking Tajikistan and Afghanistan, which opened in August 2007. US aid has also contributed to infrastructure development designed to help US military operations in Afghanistan and in the region as a whole. Countries such as Russia, China, and the United States are all looking to gain an advantage with their ties to Tajikistan to exploit the region’s natural resources. Present-day Afghanistan has been conquered by the likes of Genghis Khan, Alexander the Great, and the Mogul Empire and was a buffer zone for colonial feuds between Russia and British India. 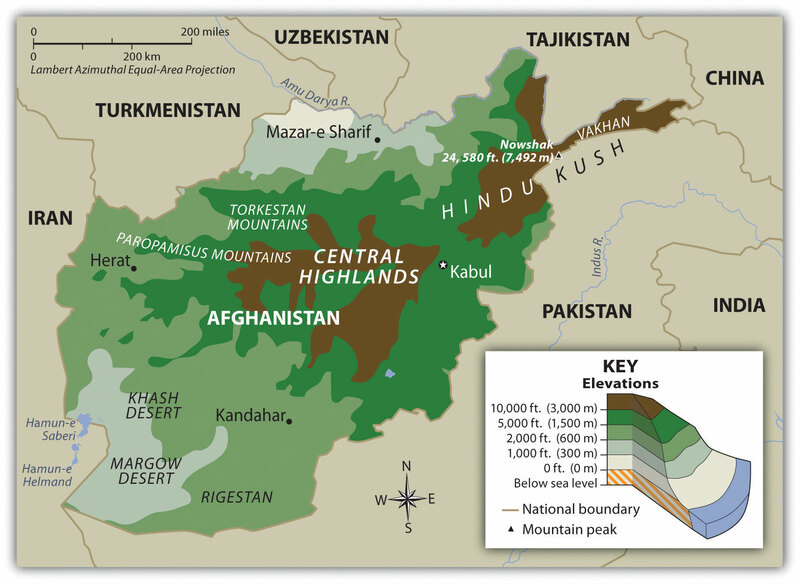 The high central mountain range of the Hindu Kush dominates the country and leaves a zone of well-watered fertile plains to the north and a dry desert region to the south. Afghanistan is a remote region without access to the sea and acts as a strategic link between the Middle East and the Far East. Kabul is the capital, and the southern city of Kandahar is the second-largest city. 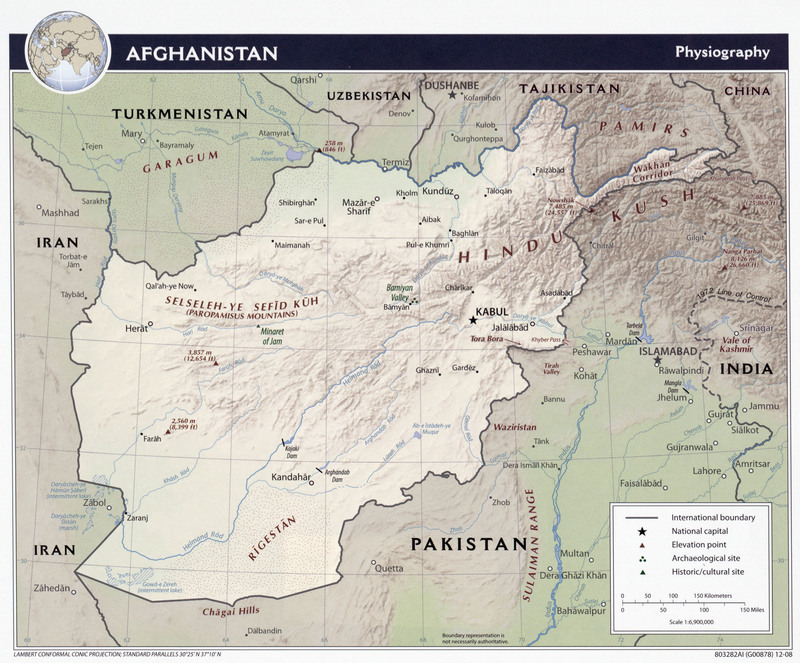 Source: Map courtesy of CIA—UT Austin Map Library, http://www.lib.utexas.edu/maps/middle_east_and_asia/txu-oclc-310605662-afghanistan_rel_2008.jpg. In 1979, the Soviet Union took advantage of ongoing ethnic warfare in Afghanistan to inject itself into the country. The Soviets pushed in from the north and occupied much of Afghanistan until they completely withdrew in 1989. During the Soviet occupation, the United States supported anti-Communist resistance groups such as the MujahideenMuslim fighters at war with those who attack or threaten their beliefs. with money, arms, and surface-to-air missiles. The missiles were instrumental in taking out Soviet aircraft and MiG fighters, which caused a critical shift in the balance of power in the war. One of the major connections between the for the Central Intelligence Agency (CIA) and Mujahideen was a Saudi national named Osama bin Laden. Support from the CIA through bin Laden to the Mujahideen was instrumental in defeating the Soviets. The power vacuum left by the retreating Soviets allowed conflicts to reemerge between the many ethnic factions in Afghanistan. Dozens of languages are spoken in Afghanistan; the top two are Pashtu and Afghan Persian-Dari. There are also a dozen major ethnic groups; the top two are Pashtun and Tajik. The groups regularly fight among themselves, but they have also been known to form alliances. Rural areas are usually led by clan leaders who are not part of any official arm of a national government. Afghanistan is a place where forming any national unity or identity is not easy. The national government in the capital city of Kabul has little influence in the country’s rural regions. The Soviet invasion brought the internally warring factions together for a short period to focus on the Soviet threat. Chaos and anarchy thrived after the Soviet forces withdrew, but the Islamic fundamentalist group known as the TalibanMilitant Islamist group in Afghanistan that took control of the central government in 1996. came forward to fill the power vacuum. One objective of the Taliban was to use Islam as a unifying force to bring the country together. The problem with that concept was that there was much diversity in how Islam was practiced by the numerous local groups. Many of the factions in Afghanistan opposed the Taliban; one such group being the Northern Alliance, which was an association of groups located in the northern portion of the country. The civil war between the Taliban and those that opposed them resulted in the deaths of more than fifty thousand people by 1996 when the Taliban emerged to take power in Kabul. The Taliban is a Sunni Muslim group that adheres to strict Islamic laws under the Wahhabi branch of the faith similar to that of Saudi Arabia. Under Taliban rule, women were removed from positions in hospitals, schools, and work environments and had to wear burkas (also spelled burqas) and be covered from head to toe, including a veil over their faces. Violators were either beaten or shot. The Taliban brought a sense of militant order to Kabul and the regions under their control. Various factions such as the Northern Alliance did not share the Taliban’s strict Islamic views and continued to oppose their position in power. After the war against the Soviet Union was over, the US role in Afghanistan diminished. The groups that the United States had supported continued to vie for power in local conflicts. Osama bin Laden remained in Afghanistan and established training camps for his version of an anti-Western resistance group called al-QaedaAnti-Western terrorist group founded by Osama bin Laden.. Just as he had opposed the Soviet Union, he now opposed the United States, even though the United States had supported him against the Soviets. The Saudi government allowed the United States to establish military bases in Saudi Arabia during Operation Desert Storm in the Persian Gulf War, and this was one reason for bin Laden’s opposition; he believed that non-Muslims should not be on the same ground as the Muslim holy sites of Mecca and Medina. The 9-11 attack in New York City was traced back to al-Qaeda and bin Laden, who was residing in Afghanistan at the time. In a military action dubbed Operation Enduring FreedomUS war on terrorism around the world, which included the US invasion of Afghanistan to remove al-Qaeda in 2001., the United States invaded Afghanistan in 2001, removed the Taliban from power, and dismantled the al-Qaeda training camps. Although bin Laden escaped, the terror of the Taliban was temporarily reduced. Women were allowed to return to the workplace, and the rebuilding of the country became a priority. The country was devastated by war and is divided by the human geography because of the various ethnic and traditional groups. Afghanistan is one of the most impoverished places on Earth. The armed conflicts in Afghanistan did not end with the US invasion. After regrouping, the Taliban rallied its supporters on the Pakistani side of the border and returned to the fighting front in Afghanistan against North Atlantic Treaty Organization (NATO) and US forces. Osama bin Laden was killed by US Navy Seals in 2011. Source: Photo courtesy of the US Department of Defense. Fighting between Western forces and the Taliban in Afghanistan continued to provide the exiled bin Laden a platform to promote his al-Qaeda terrorist activities from his hiding place. 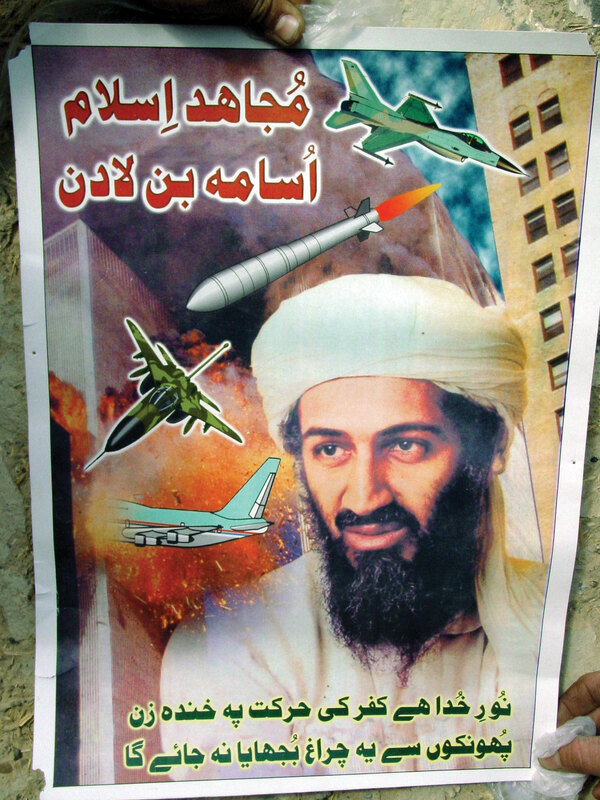 Efforts to locate and marginalize bin Laden continued through to the US presidency of Barack Obama. In May of 2011, on orders from President Obama, a team of US Navy Seals were sent into the city of Abottabad, Pakistan, to a private compound where intelligence indicated that bin Laden was hiding. In the confrontation, the US Navy Seal team killed bin Laden. The entire operation was conducted without the awareness of the Pakistani government. This event may have impacted al-Qaeda but has not likely diminished the fighting in Afghanistan. The country is the world’s largest producer of opium, a product extracted from a poppy plant seedpod that can also be refined into heroin. The expanding poppy cultivation as well as a growing drug trade may account for one-third of the country’s income. More than 80 percent of the heroin consumed in Europe is grown in Afghanistan. The drug trade has only multiplied the problems in this devastated country. Prudent and effective methods for the government to address the drug trade are matters for debate and negotiation. Most of the country is ruled by warlords and clan leaders who have few resources other than tradition and custom. Afghanistan’s infrastructure has been destroyed through warfare, and its government is dependent on foreign aid; without it, this country cannot recover to integrate itself with the global economy. Central Asia has enormous oil and natural gas reserves, and the core economic regions of the world will continue their work to extract these resources for economic gain. In response to the events of September 11, 2001, the U.S. and its allies launched an invasion of Afghanistan to overthrow the Taliban regime and destroy the al-Qaeda terrorist network it supported. In the years since, the International Security Assistance Force, under NATO leadership, has taken charge of extensive provincial reconstruction and stabilization efforts, helping set the economic, political and security conditions for the growth of an effective, democratic national government in Afghanistan. As the lead member of the international coalition, the U.S. contributes troops to both the ISAF [International Security Assistance Force] mission and Operation Enduring Freedom, tasked with pursuing al-Qaeda throughout Afghanistan’s inhospitable border region with Pakistan. The Western military troops aligned themselves with Afghan groups such as the Northern Alliance to defeat the Taliban and remove the al-Qaeda presence. Competing groups and the rough terrain make keeping the peace in Afghanistan difficult. The United States turned control over to NATO in 2006. 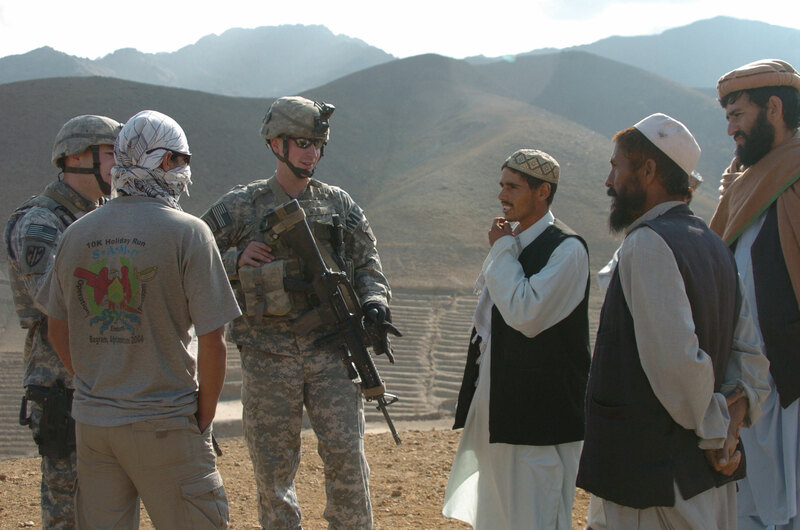 In this photo, soldiers representing the 561st Military Police Company, Fort Campbell, Kentucky, are speaking with local Afghans about insurgent activity near Bagram, Afghanistan. Source: Photo courtesy of the US Department of Defense, taken by Dexter D. Clouden, Sgt. 1st Class, 2006. 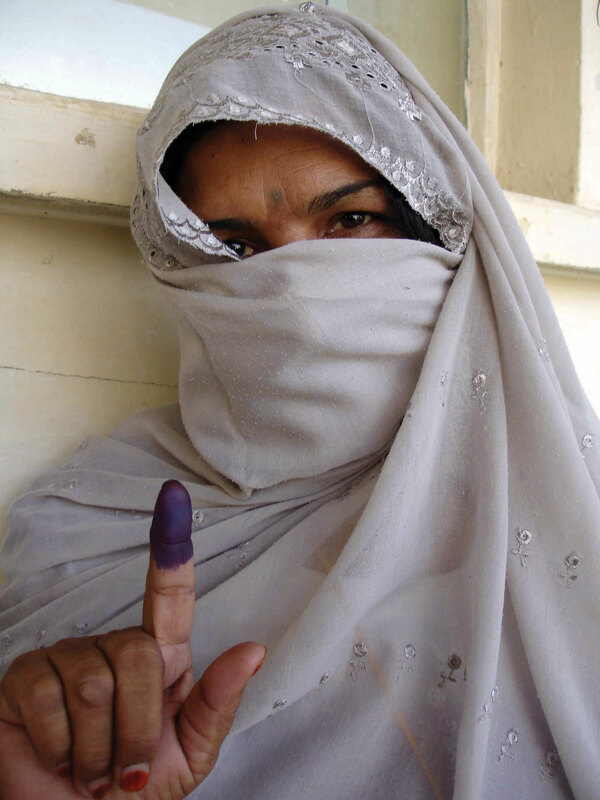 After voting in Afghanistan, individuals dipped their fingers in ink to indicate they had voted and were not allowed to vote more than once. This photo indicates that women were also allowed to vote in Afghanistan in the 2005 elections for provincial councils and parliamentary positions. Source: Photo courtesy of the US Department of Defense, taken by Staff Sgt. Jacob Caldwell, 2005. Democratic elections were held for the office of president in Afghanistan beginning in October of 2004. Hamid Karzai was the country’s first elected president in the twentieth century. He was reelected as president in 2009 under the cloud of claims of election fraud. The right to vote was restored to women in the 2004 election. To combat voter fraud, people would dip their fingers in ink to indicate they had voted and to ensure they did not vote more than once. Voting has not been a smooth process because democratic rule is new to Afghanistan. Afghanistan’s future is insecure. Most of Afghanistan is still ruled by warlords and clan leaders. The Taliban has sustained its support in Afghanistan from bases on the Pakistani side of the border, and United Nations (UN) and NATO troops continue to confront the Taliban and work toward stability. Kandahar, the second-largest city in Afghanistan, is located in the south, an area where support for the Taliban is stronger than it is in Kabul in the north. In 2010, a US government report indicated that vast amounts of mineral wealth were discovered in Afghanistan by American geologists and Pentagon officials. Enormous deposits of iron, copper, gold, cobalt, and rare industrial minerals such as lithium are reported to be present in Afghanistan. Total reserves are unknown or have not been released but if extracted would result in trillions of dollars of economic gain for the country. Lithium is highly sought after and is used in the manufacturing of batteries, computers, and electronic devices. The report indicated that Afghanistan could become the world’s premier mining country. In this photo is the Lataband Road between Kabul and Surobi. The dry, treeless expanse of this region is home to Afghanistan’s vast mineral wealth. Source: Photo courtesy of Sven Dirks, http://commons.wikimedia.org/wiki/File:Lataband_Road_hut.jpg. Discovery of vast resources helps place the war in Afghanistan in perspective with respect to global competition over the control of resources. It has been reported that China has already offered millions of dollars in incentive money to Afghan government officials to allow its country to mine copper. Bribery and corruption in the Afghan government is a serious impediment to a stable political environment, but criminal activities are projected to persist and swell with the potential for additional mining wealth. Afghanistan does not have a long-standing tradition of mining. Agriculture has been the main focus of economic activity for the rural communities. A newfound potential for mineral wealth will change the future of Afghanistan. It will be interesting to watch how Afghanistan adapts to and benefits from the discovery of previously unknown resources. Central Asia is a landlocked region that receives little rainfall. Two large desert regions are located at the region’s core. Vast grasslands called steppes dominate the northern sector. High mountains to the east provide a border between Central Asia and China. Central Asia (a.k.a. Turkestan) has been dominated by the Soviet Union during the twentieth century. The transition to independence has challenged the region to adjust to changes in political and economic systems. The demise of the Aral Sea is being caused by the diversion of water from the two rivers flowing into the sea. A once-thriving fishing industry has been destroyed and environmental damage has been catastrophic. Armed conflicts in Afghanistan continue between Western military forces and the Taliban over the control of the country. Clan leaders are a main component of the political fabric of the country. The diversity and fragmentation of the country make it almost impossible to govern. Afghanistan is one of the poorest countries in the world based on data on standards of living. However, the country has one of the largest deposits of valuable minerals and ores in the world waiting to be extracted. The deposits are the target of multinational corporations around the globe. Why is Central Asia often referred to as Turkestan? What does the suffix “stan” indicate? Which country in Central Asia has a forward capital and why? How is the Tengiz basin important to the global economy? Where is it located? How have problems with the Aral Sea affected the people of the region? What is attracting multinational corporations to Central Asia? How do the corporations impact politics? What happened in Tajikistan after it received independence in 1991? How did this affect the country? List at least five general trends that have been occurring in Central Asia since the collapse of the Soviet Union. Why did the CIA get involved in the 1980s war in Afghanistan? Who acted as a CIA contact? What role did the Taliban once have in Afghanistan’s government? Why were not they allies with Iran? What are the main methods of gaining wealth in Afghanistan today? How might this change in the future?